The distinctive sail-shaped Burj Al Arab Jumeirah is one of the most famous architectural delights to grace Dubai's iconic skyline. Yes, the Burj Al Arab Jumeirah is as luxurious on the inside as it is on the outside, featuring authentic suites, warm, rich decors, and floor-to-ceiling windows that overlook the stunning Arabian Gulf. Step inside this 5-star establishment and you'll be taken aback by its spacious and intricately designed lobby, boasting an elegant water feature and large, vibrant fish tank. Among the first-class facilities here you'll find a plethora of boutique shops, opulent terrace area, Sinbad's Kids Club, Talise Spa and Health Club, Talise Fitness Centre, five swimming pools and eleven world-class restaurants and bars. The Burj Al Arab also provides concierge and transportation services, access to its own private beach (fitted with luxurious cabanas and comfortable sun loungers), complimentary access to the exciting Wild Wadi Waterpark. 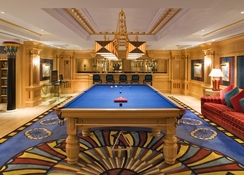 The Burj Al Arab Jumeirah is an all-suite hotel standing 56 storeys high, comprising of 202 duplex suites, subdivided into Deluxe Suites, Panoramic Suites, Club Suites, Diplomatic Suites, Presidential Suites and Royal Suites. 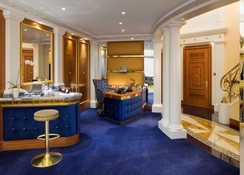 Every floor has its own reception with en-suite check-in, butler service that provides around the clock assistance to each and every guest. All suites feature floor to ceiling windows, offering a breath-taking view of the sea. 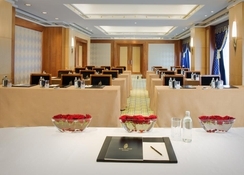 All suites are equipped with the latest technology, laptop computers and internet access. The finest materials have been sourced from around the globe, coming together in exquisitely designed and crafted interiors. 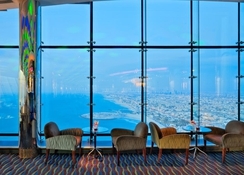 Burj Al Arab Jumeirah has a world-class line up of restaurants, bars and lounges to offer its guests. 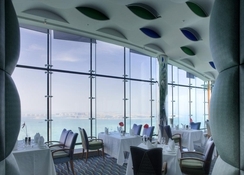 The signature restaurant Al Mahara serves seafood specialities and features an expansive glass wall looking into the rainbow-coloured aquarium, while the Skyview Bar is suspended 200 metres above sea level. Al Muntaha restaurant is ideal for afternoon tea and cocktails. The other restaurants offer delectable Arabian, modern European, Mediterranean, and International cuisine. Guests of the Burj Al Arab Jumeirah can enjoy access to the newly refurbished private beach of the Jumeirah Beach Hotel. The beach now features sun loungers, cabanas, along with spectacular views of the Arabian Gulf and the hotel itself. The Burj Al Arab Jumeirah also offers complimentary access to all the watersports activities at Wild Wadi Waterpark, which is just five minutes from the hotel. Guests can also pamper themselves and spend time relaxing at the Talise Spa, which has some carefully developed luxury products. They could also enjoy the indoor infinity pools, saunas, hot tub and treatment rooms, steam rooms and plunge pools. 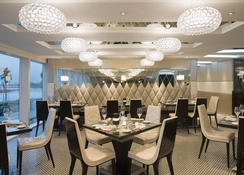 The Summersalt Beach Club, which is exclusive to Burj Al Arab Jumeirah and Jumeirah Al Naseem, accommodates guests on a first come first serve basis. 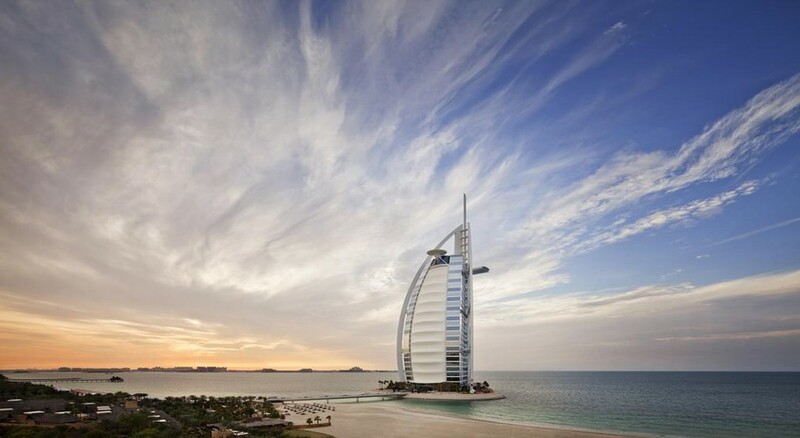 Burj Al Arab outlets are currently facing challenges with the age policy, they have strict age policy guidelines to follow, according to the law in Dubai, children below 21yrs old are not permitted in Burj Al Arab bars. Should the guest arrived is underage, bars will not allow them to dine in and they will move the booking to another outlet. Complimentary access to Kid’s Club. Accessible to guests staying at Burj Al Arab Jumeirah, offer a safe, fun and friendly environment for your children to explore and make new friends in closely supervised surroundings. These offers are valid for stays between 4 December 2017 to 30 April 2018.